Have you seen the latest "caviar" nails trend? 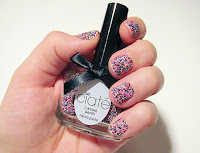 The brand Ciate released a very fun and different nail design kit using tiny glass beads resembling caviar. I am always up for trying new trends, but at $25.00 for the kit, it just wasn't worth the price. So I decided to try a DIY caviar-esque manicure with a much cheaper price tag! All of the products needed for this manicure you will already have except for the beads. pour microbeads onto your nail; be sure to cover the whole nail! Step 4: Pour excess beads back into the container!